Not to be confused with Ken Keeler. 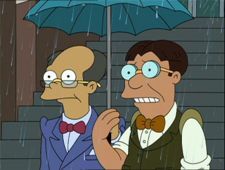 Beeler's name is very similar to that of Futurama writer Ken Keeler, who, like Beeler, holds a PhD and can therefore be referred to as "Doctor". Keeler was originally called "Ben Beeler" by both his college roommate and his mother, and so the other writers named the character after him. Beeler's colleague actually bears a stronger resemblance to Keeler. ^ Commentary for "A Clockwork Origin" on Volume 5, disc 2. ^ a b Written by Ken Keeler. This page was last edited on 9 March 2014, at 21:51.